Despite the fact that Michael Jordan has not played for the NBA in over a decade, the "Air Jordan" is still regarded as one of the most popular, if not the most popular, sneaker line of all time. But the Air Jordan almost never happened. Let's take a look back at how Nike landed Michael Jordan. MJ wore Converse during his time at the University of North Carolina, but the only reason he did so was because Dean Smith was paid $10,000 by Converse in order to have his players wear the brand. When Jordan decided to forgo his senior season at UNC and declare for the 1984 NBA Draft, he showed up at Converse's headquarters to allow them to pitch him on joining the Converse team, not because he wanted to, but out of respect for his college coach. Converse promised him that he would be treated like the company's other superstars, such as Magic Johnson, Larry Bird, and Dr. J, and that they would pay him $100,000 annually, commensurate with what the other stars on the Converse roster made. Though the pitch interested Michael, the brand was becoming less popular nationwide, and was slow to adopt new innovations in their products, such as utilizing leather on their sneakers. In other words, the company didn't stand a chance. Joe Dean, the director of marketing for Converse, said of the situation: "We were in a tough spot… If we gave Michael more [money], what would we have done with Magic, Bird, and Dr. J?" Though Michael Jordan's name is now synonymous with Nike, believe it or not, the brand that Jordan wanted to wear in the NBA was not Nike, but adidas. Jordan even said that he had never worn a Nike shoe in his life before he signed his Nike deal. When Jordan returned from the 1984 Olympics, he told his agent, David Falk, that he had no interest in signing with Nike, and that he wanted Falk to "do what [he needed] to do to get [Jordan] with adidas." Falk though, wanted Jordan to sign with Nike. Falk had a strong relationship with Rob Strasser, who did all the deals at Nike. A majority of Falk's clients, including Bernard King, Phil Ford, and Moses Malone, were Nike signees. He wanted Jordan to be among those signees. So, Falk did what anyone would do when they want someone to do something; he called Jordan's parents. He told Jordan's parents that he needed Jordan at the Nike presentation. It worked. Jordan was on his way to Beaverton, OR to attend Nike's presentation. When they got to Nike's headquarters, they met with Strasser, designer Peter Moore, and Howard White and Sonny Vaccaro – the individuals responsible for basketball at Nike. At the presentation, Jordan was shown his own highlight tape to the Pointer Sisters "Jump," in addition to showing Jordan and red-and-black shoe design. Moore told Jordan that they could tailor the shoe to Jordan's liking; something that was revolutionary at the time. No company tailored shoes to athletes' needs at the time; athletes took what the companies gave to them. Said Jordan of the presentation years later: "They really made a great effort of trying to have my input of the shoe." Later on in the presentation, they moved into another room, and Jordan was shown more potential plans if he decided to sign on with Nike. Phil Knight, Nike's president and co-founder, walked in during these talks. It was at this point that Rob Strasser, who knew Jordan loved cars, said to Jordan while reaching in his pocket: "If you come with Nike…"
Phil Knight clutched his chest, as if Strasser had car keys in his pocket. He didn't. Strasser took out two die-cast Mercedes cars. "I think Phil almost had a heart attack," said Falk. After the entire group went out to dinner, Falk asked Jordan what he thought of the presentation. Jordan responded: "I don't want to go to another meeting." 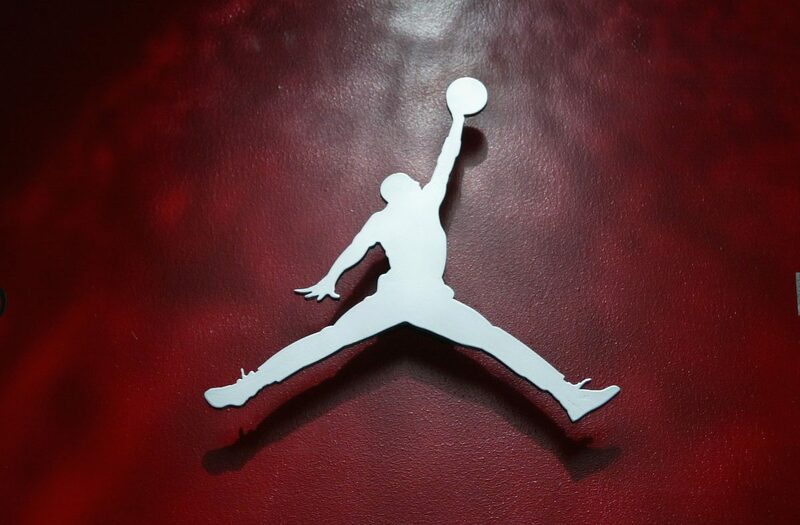 Nike offered Jordan $500,000 a year in cash for five years, by far the richest sneaker contract in history. James Worthy had previously held the record for the richest sneaker deal, making $150,000 annually for eight years with New Balance. In addition to stock options and other miscellaneous parts of the deal, Falk said Jordan would stand to make $7 million over five years, as long as Nike did not terminate the contract. Nike put a clause in the deal that stated that if he didn't do one of three things in his first three years; 1) win Rookie of the Year, 2) become an All-Star, or 3) average 20 points per game, that the company could end the deal two years early, unless he sold at least $4 million worth of shoes in his third year, in which he would get the final two years of the deal. All of those stipulations seem silly in retrospect, for Jordan is now widely regarded as the greatest basketball player of all-time. But there was one more thing. Michael Jordan still wanted to sign with the shoe he had worn his whole life; adidas. Michael made a last ditch effort to sign with the German shoe brand. Said Jordan: "I went back to my adidas contract and said, 'This is the Nike contract – if you come anywhere close, I'll sign with you guys.'" Adidas was in a state of flux after their founder Adi Dassler died in 1978. His wife, Käthe, took over the business, and had her son and four daughters running separate divisions. The husbands of the daughters were also very involved with running the company, which led to tensions. Käthe was not in good health, and a succession plan, rather than signing Jordan, was the top priority for adidas at the time. Adidas could not come anywhere close to Nike's offer. Fast forward 30 years from that time, and the Air Jordan is arguably the most popular sneaker line of all time. With nearly $3 billion in annual sales, and a new release happening nearly every week that sells out almost instantly, it's clear to see that Nike made the right decision by signing Michael Jordan. But what if MJ did end up signing with adidas? Would his sneakers still be as popular now? "We'll never know," said Jordan.